The second part of an interview with Shipibo Shaman Enrique Lopez. Interviewed at Mishana, Amazon Rainforest Peru, by Howard G Charing and Peter Cloudsley, November 2007. Enrique discusses his early years in the indigenous Shipibo community in the Ucayali region of the Amazon Rainforest in Peru. Enrique talks about the Shipibo views on Ayahuasca and medicinal plants. Tell us about the use of Tobacco. Tobacco is very necessary for a shaman’s work. Smoke protects against enemies and badness crossing your path. Before you light a mapacho you icaro it, then you blow the smoke onto your body before the session begins. You can also cure a child of susto (fright) by blowing smoke over it but babies are very sensitive and if very small, they can be made worse – cutipado – in which case you use agua florida. You can also chant to it and the mother’s milk. What is your state of mind and vision when you go around to each person before the session, blowing tobacco (mapacho) smoke? I am asking the ayahuasca to give every one a good mareacion, or vision. The tobacco makes a kind of bridge with the ayahuasca. We normally prefer the cashimbo (Shipibo pipe) in a ceremony not mapacho cigarettes. It has a strong effect, and also calms people when the effects are too strong. Some shamans drink pure juice of tobacco macerated with alcohol instead of ayahusca. First he drinks and goes off into another world and has a green vision. That means patterns only. Sometimes the animals and things you see, have patterns on their skin. It happens when you sing in Shipibo, how do explain this? What I do when I chant is to call the animals for protection. Otorongos may come near to us but sometimes they get too near and are ferocious and out of control. This can be caused by an enemy who has found a way to harm me. The thick bark and seeds of the Ayauma tree is good to protect against this. You take a vapor bath in it before the session. Camalonga (a seed) is good too, it returns the harm from where it came and the wrong doer becomes ill. Lupuna and Catauhua are also good against brujeria (bad magic). Huayruro is not so much used. Ajo sacha can be used in protective baths, for illnesses like arthritis, and as a powerful teacher. It makes you hard working, turns around a run of bad luck – saladera, helps you in fishing and hunting. You can also pour the ajosacha up the nose of the dog to make a good hunting dog. Also loose women (pishcotas) can be cured with ajosacha. I left Roaboya in 1998 and went to live in Trujillo to sell healing plants and ointments made from boa, otorongo, bufeo colorado etc. I found many charlatans there selling any old thing. I worked mainly with banos florales and didn’t use ayahuasca. I also felt a lot of envy from people there, and once it made me very ill. I couldn’t walk, and was urinating blood so I went to Lima by bus and from there to Tingo Maria where it got much worse, and I only just got to Pucullpa to return to my community. I was 24 then. Everyone said it was dano (envy and bad magic). I cured myself with Catahua, Lupuna and Ayahuma. At the bottom of the saucepan we placed crushed green bottles before adding the plants and barks. When I was well I returned to Lima for a few years, and then my wife got a job as a cook at a tourist lodge, so that’s how I came to live in Iquitos. My uncle Benjamin (who is from Pauyan) still works there occasionally. Authors note: Benjamin Ochavano a powerful Shipibo shaman, and an interview with him is also published on this blog. How does a Shaman help people who have experienced harmful and negative sorcery? Enemies can come from anywhere. If I heal someone, I undo someone’s dano – illness from black magic – and that makes me the enemy of the brujo who tried harm or kill the person. 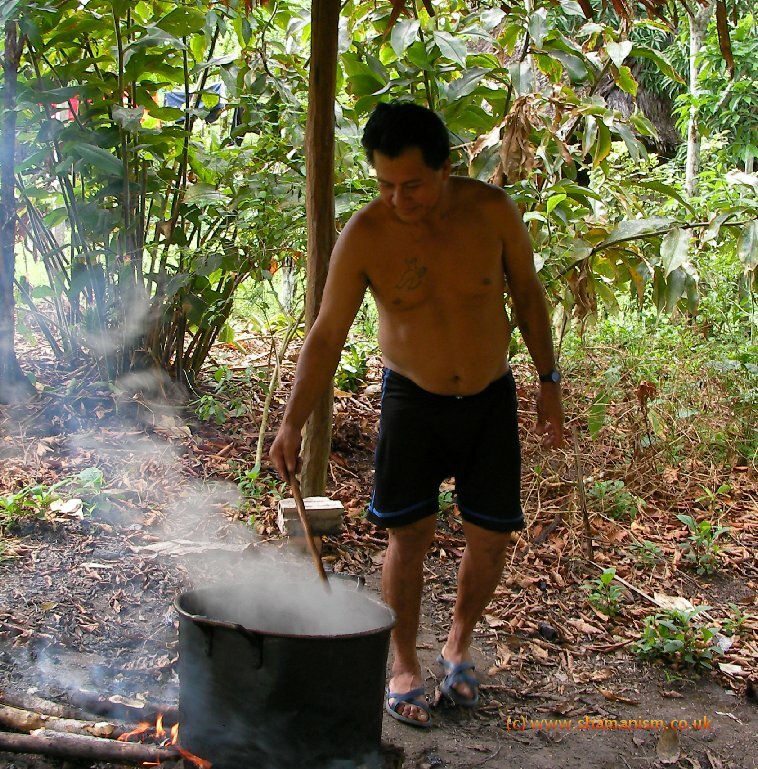 What is it important for an Ayahuasca shaman to know? They should know how to bring about the vision. Second, how to bring the effects down again when a patient is suffering. Thirdly, they must know how to close the session. These are the most important things, but there are shamans who take ayahuasca without knowing them. Howard G. Charing, is an international workshop leader on shamanism. He has worked some of the most respected and extraordinary shamans & healers in the Andes, the Amazon Rainforest, and the Philippines. He organises specialist retreats to the Amazon Rainforest. He is the author of the best selling book, Plant Spirit Shamanism (Destiny Books USA).